Being a 120yr old mining town you’d expect to see many relics of the old mines, and there are, but not as many as you’d think. The vast mines & above ground operations of yesteryear were often broken down and replaced when new technology came along or when mines were abandoned. There are of course photos of the old operations, but not so many relics. Behind the original Broken Hill mine (Which is now a tour operation) I found this abandoned old car. It appears someone has tried to drive it in here in a wet period (of which Broken Hill has very few) and got it bogged. They’ve used planks to keep it out of the mud, but the back wheels have slid off, and the car has never moved again. Judging by the age of the car I would have thought this happened a very long time ago, but on the back of the vehicle are plastic water (or chemical) containers leading me to believe this car was not abandoned too long ago. In fact, just reading over this post I’ve postulated a theory. It was wet (which is rare), there is an old car with water tanks on the back, and a huge black water tank about 20 metres away. Perhaps someone was attempting to fill the portable water tanks from the black water tank which was overflowing in a rare wet period? If anyone can tell me what sort of car this is, or even when it was abandoned, I’ll update the post to keep everyone informed. Broken Hill was founded on the ‘Line of Load’ a massive ore body that runs through the middle of ‘Broken Hill’. The original Hill is now gone, but for a few tiny remnants, and in its place lies a vast hill of excavated earth. This hill is said to be about the size of the original ‘Broken Hill’. Atop the vast hill is the Broken Earth Cafe & Restaurant which affords views over all the town. You can even see out to the Hill of Sculptures 6km’s away, mentioned a couple of days ago. Don’t let a map view of the area put you off. It looks like a big mine excavation site (and it is) but from the top you can see for miles, and have a meal at the same time. Broken Hill is a small town on the Edge of the Australian Outback. 1200km (745 miles) west of Sydney & 500km (310 miles) north east of Adelaide, it’s a very, very long way from anywhere. Broken Hill is also known as the ‘Silver City’ because of the vast amounts of silver extracted from the mines over the past 120 years, and being a mining town, many of it’s road are named after chemicals. In fact the road we’re standing on in the pano above is ‘Chloride St’, with Sulphide, Bromide & Oxide Streets running parallel to the main road. At 5.43 am on the 30th of October 2006, I was standing in the silent wonder of the outback, on a hill 1200km west of Sydney, 400m/1300ft high & 6km out from the small town of Broken Hill. [pop. 21,000] Atop this hill lies the Broken Hill Sculpture Symposium, started on April Fools Day 1993, and finished in May of the same year. There are 12 pieces in the exhibit, with Bajo el Sol Jaguar (Under the Jaguar Sun) being the most striking (IMHO), and the one I’ve chosen to highlight in this pano. In order to get to the Sculptures you can either drive to a carpark / picnic area, followed by a 20min walk or get a key from (and pay a fee to) the Tourist Info centre so you can pass through 2 gates that allow you to drive to the top. Either way, it’s well worth it. Toowoomba ‘The Garden City’, is a south-east Queensland city famous for its annual Carnival of Flowers, held in Spring. But Autumn is when it really shines in its full splendor. Situated on the edge of the Great Dividing Range, 700 metres above sea level and with lower Autumn and Winter temperatures than the surrounding area, Toowoomba benefits from a quite unique climate. All over the city there is a significant number of deciduous trees from around the world, giving a singular display of autumn yellow, orange and red among the green foliage. 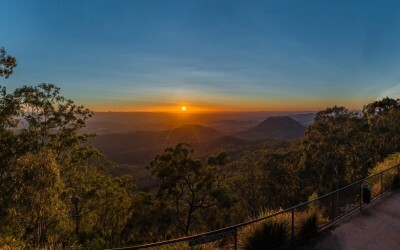 Being there at this season is a privilege and watching sunrise at Picnic Point, just on the edge of the Great Dividing Range, is as much astonishing as freezing.